Trinity Church’s Girlfriends 2016 Conference is right around the corner. This year, the conference theme is “I AM HER”. I would define this theme’s woman as the woman being described in Proverbs 31:25. 1. Pray and meditate on the Word of God daily. My best days always begin with time alone in prayer and meditation as soon as my feet touch the floor in the morning. I go directly from bed to brushing my teeth to carrying a cup of coffee to my favorite spot on my exercise mat. My time alone in prayer here prepares me for whatever I am going to face that day. 2. Exercise 5 times/week. When I finish my time in prayer, I start my exercise routine. I don’t think it really matters what type of exercise you do, just that you do it regularly. My friend, Crystal, is a triathlete. Her exercise regime requires more than an exercise mat. My friend, Jeanette and her sister Dilicia, are Zumba instructors. I lovingly call them the Zumba Sisters. Zumba requires a pair of tennis shoes and a playful attitude. The best thing about exercise is it helps keep your body strong and supple and it fights the impacts of aging. 3. Eat lightly. I am not one for dieting. For me, it takes too much concentration on food. I eat good food in moderation and enjoy an occasional piece of pie when I am on vacation! 5. Moisturize daily. I strive to keep my skin and my hair as healthy as I can. I use lots of moisturizer on my skin and coconut oil and Shea Moisture products on my hair. Creating a peaceful home life has been a goal I have shared with my husband of thirty years, David. No, we haven’t agreed with each other on everything, nor has every day been easy. We have had many challenges along the way but, we agreed early on that home was a safe zone– a place of acceptance, safety, and encouragement. Having a peaceful home makes facing the world easier. In my life now, I am engaged in an ongoing adventure through a partnership with Cambodian Care Ministries. 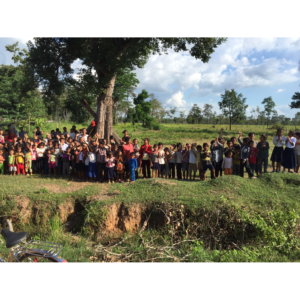 The photo below shows many of the members of the community in Kratie Province who greeted us with so much excitement when we arrived there for the first time. We envision a new water well for the community, micro-farm demonstration projects, vocational training, a church, and a health center on this beautiful lot. 8. Phone a friend Where would I be without my friends? Here I am with my BFF of over twenty years, Gina, wearing missions-chic fashion wear on a 22 hour trip from the United States to Cambodia last summer. There are so many ways to get out in the world and serve someone in need. My friends, Kathy and Elba, enjoy using their nursing skills to serve others on the mission field. Here they are in Kratie Province, Cambodia after a long day serving more than 90 children and adults in an outdoor, mobile clinic. Change is one aspect of life over which we have no control. Change is constant. Change brings challenge and opportunity. I am constantly looking for opportunity in whatever change is occurring own life. Just the other day, my grandson and I were using iPhones together! I could hardly believe it as I watched him swipe the screen and remove a text message that popped on his mom’s screen while he was watching a kid’s video. I realized that Noah was going to learn things and go places that I will never have the time to discover, but I am so glad that we can learn some things together now! What are your essentials for feeling strong, purposeful, and optimistic?